By: Lauri M. Aesoph N.D. I you were an alien visiting our planet, you might think Earthlings never age. Even as awareness about aging rises, most major magazines and television stations still fail to display vital, older people. Medical journals, on the other hand, harp on the infirmities of old age. It's no wonder we fear and even deny our own inevitable aging. Grower older can't be avoided, but it doesn't have to mean the loss of health, mind and independence. In fact, research seems to indicate the opposite. 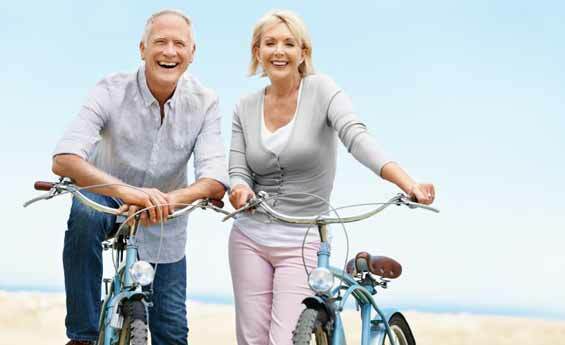 By paying a little attention to lifestyle, most older individuals can live active, healthy lives and we can all shatter those old age myths. Myth #1: When I get old, I'll become senile. Many of us view the elderly as doddering old creatures, unable to think for themselves and constantly forgetting the most mundane things. In reality, senility only strikes five percent of Americans. The other piece of good news is that some age related declines in mental functioning can be prevented or even reversed. When scientists from Tufts University reviewed a number of studies, they discovered that vitamin deficiencies account for many of the symptoms of senility. Just as vitamins are needed for normal nervous system development in children, they are required for normal neurological functioning in adults–young and old. For example, low folate levels in the elderly can cause forgetfulness, irritability and possibly depression. Vitamin B6, a nutrient required to make many neurotransmitters, may lead to peripheral neuropathy (a disorder of the nervous system where the limbs feel numb or tingle) if deficient. The nutrient that ensures nerves are protected with a myelin sheath, vitamin B12, can be responsible for delusions and mood disturbances when levels fall below normal. Most of us think that nutrition must be poor before these kind of deficiencies show up. However, researchers have found that seemingly healthy, elderly subjects can still exhibit low vitamin levels. In fact, an older individual can be lacking in certain vitamins for years without any hint of a deficiency. Symptoms, mental or otherwise, may not show up immediately and even the usual blood tests employed to detect lagging nutrients are not always reliable (1). Myth #2: Old age means losing all my teeth. If you're not worried about losing your mind when you're old, you might fret about losing your teeth. Periodontitis, or late stage gum disease, is the primary cause of tooth loss in adults. This condition commonly begins as gingivitis where gums turn red and begin to swell and bleed, a situation experienced by too many people. Fortunately healthy gums and avoiding false teeth are both reasonable goals. The elderly of today are much more likely to keep their teeth than previous generations. Even so, dental disease is prevalent. The New England Elders Dental Study found the beginnings of periodontal disease in over 3/4 of the 1150 persons examined. Part of the problem, said these investigators, was that education and dental care for this population are overlooked by both dentists and the patients themselves (2). The sad part of this situation is that proper dental hygiene and regular cleanings by the dentist are usually enough to stave off infection. Another simple and inexpensive way of preventing or at least halting the progression of periodontal disease is to store and replace your toothbrush properly. Although most of us are in the habit of keeping our toothbrush in the bathroom, this is not recommended. Bathrooms are the most contaminated room in the house. Healthy people should replace their toothbrushes every two weeks; those with a systemic or oral illness more often. Everyone should use a new toothbrush when they get sick, when they feel better and again when they completely recover (3). Finally, an important aspect of both dental and general health is immunity. It has been determined that a suppressed immune system is associated with the rapid progression of periodontal disease. A Midwestern research group found that cigarette smoking was one habit that dragged down immunity and sabotaged periodontitis treatment (4). Other lifestyle behaviors that theoretically could do the same include poor eating habits, stress and other immune depressors. Myth #3: The older I get, the sicker I'll get. It's true that as we age, our physiology changes. These changes can lead to poor health if not addressed. But old age doesn't have to mean feeling sick and tired. An important part of staying well into the older years is keeping your immune system operating at its peak. Aging is generally associated with lagging immunity and consequently more infections especially of the respiratory system. However John Hopkins' Professor Chandra discovered that when independent, apparently healthy, elderly people were fed nutritional supplements for a year, their immunity improved. Immunological responses were so marked that those who were supplemented (versus the placebo group) were plagued with less infections and took antibiotics for less days. It should be noted that these effects were achieved with a moderate amount of nutrients in a balanced formula; megadoses of some vitamins can actually impair immunity (5). Besides taking care of your immunity with supplementation, diet, exercise and other measures, you can prevent many age-related diseases with specific health precautions. For example, there is evidence that smoking and low plasma levels of vitamins C and E, and beta-carotene contribute to cataracts (6). Dr. Dean Ornish showed that a one year program of stress management, moderate exercise, no smoking and a low-fat vegetarian diet may reverse the development of coronary atherosclerosis. Left untreated, atherosclerotic plagues usually continue to grow (7). Many other chronic diseases can also be prevented or treated with lifestyle changes. Calcium and magnesium supplementation helps some individuals with hypertension. Most are helped by high potassium foods (fruits and vegetables), salt restriction and weight maintenance. Keeping blood pressure under control can also decrease the risk of a stroke. Adult-onset diabetes is usually treated best with dietary measures such as reducing simple sugars, consuming a lot of fiber and taking chromium supplements (8). It's estimated that half of all types of cancer are linked to diet. This explains why less fat, lots of fruits, vegetables and fiber, vitamins A, B6, C and E and zinc and selenium all appear to play a role in cancer prevention (9). Myth #4: Lifestyle changes won't help me when I get old. It's a mistaken notion that at a certain age, you reach the lifestyle modification point of no return. If you've used this as an excuse to cling to old, comfortable, unhealthy habits, it's time to let go. Of course, it's always best to live as healthy as possible as young as possible. But for those in their golden years, there's still plenty of hope. Two of the most difficult habits to break, smoking and a sedentary lifestyle, can, when discarded, yield great health results. In 1990, the Surgeon General at that time, Antonia Novello, MD, MPH, declared that "even people who quit smoking at older ages can expect to enjoy a longer and healthier life compared with those who continue to smoke" (10). Although the incidence of cigarette smoking naturally declines with age, those who continue to smoke should be aware of the numerous advantages of quitting. In as little as 20 minutes, blood pressure, pulse and body temperature all return to normal. Eight hours later, oxygen levels in the blood rise. After a day, the chance of a heart attack decreases. In five years, the risk of lung cancer falls to about half and in five more years lung cancer risk almost parallels that of a never-smoker (11). All these changes occur no matter what your age when you quit. Frailty in the older person can't be totally blamed on aging. At least some weakness occurs because of physical inactivity. A regular exercise program not only decreases the risk of chronic illness, but can help prevent early death. Those who begin exercising later in life can slow or even reverse organ deterioration. When elderly individuals exercise, they reap a number of health rewards. Aside from fighting chronic diseases, their heart is stronger, muscles are more fit and flexible, mood is enhanced, and falls and fractures are less frequent. While exercise alone probably doesn't significantly extend life beyond 80 years old, it can improve your quality of life (12,13). Myth #5: As long as I maintain the eating habits I had when I was younger, I'll stay healthy. Perhaps one of the biggest fallacies of good health is that nutritional needs don't change with age. Just as children and teens have different dietary requirements than adults, so do the elderly differ in their needs from younger individuals. Experts are still arguing about what and if diet needs change with age. Because of this it's estimated that anywhere between 0 and 40 percent of the independent elderly are nutritionally deficient. A number of factors feed into poor dietary intake. Chronic diseases, both physical and mental, can cause nutritional problems. Various medications can impair nutrient availability or discourage eating due to loss of appetite. If you wear ill-fitting dentures, pain can prevent you from eating. Elderly who live alone may feel isolated and uninterested in eating. But even if you are older and healthy, the very process of aging alters your metabolism and physiology. Stomach acid declines, thus affecting some nutrient absorption. Many older people feel full quicker because of an increased sensitivity to the satiety peptide, cholecystokinin octapeptide. Aging also dampens the body's appetite center, and consequently eating. Finally, it's suspected that an older palate doesn't detect those tastes that drive us to the dinner table: salt and sweet (14). Aging is inevitable. Poor health is not. Regular exercise, nutritious eating (appropriate for your age) and a lucky roll of the genetic dice can help you to age with grace and good health. Rosenberg IH, Miller JW. Nutritional factors in physical and cognitive functions of elderly people. American Journal of Clinical Nutrition 1992;55:1237S-43S. Douglass CW et al. Oral health status of the elderly. New England Journal of Gerontology 1993;48(2):M39-M46. Glass RT. The infected toothbrush, the infected denture, and transmission of disease: a review. Compendium of Continuing Education in Dentistry. 1992;13(8):592-9. MacFarlane GD, Herzberg MC, Wolff LF, Hardie NA. Refractory periodontitis associated with abnormal polymorphonuclear leukocyte phagocytosis and cigarette smoking. Journal of Periodontology 1992;63(11):908-13. Chandra RK. Effect of vitamin and trace-element supplementation on immune responses and infection in elderly subjects. The Lancet 1992;340:1124-27. Harding JJ. Cigarette smoking and risk of cataracts (letter). Journal of the American Medical Association 1993;269(6):747. Ornish D et al. Can lifestyle changes reverse coronary heart disease? The Lancet 1990;336:129-133. Johnson K, Kligman E. Preventive nutrition: disease-specific dietary interventions for older adults. Geriatrics 1992;47(11):39-49. Leis HP. The relationship of diet to cancer, cardiovascular disease and longevity. Internal Surgery 1991;76:1-5. Novello AC. Surgeon General's report on the health benefits of smoking cessation. Public Health Reports 1990;105(6):545-48. Timmreck TC, Randolph F. Smoking cessation: clinical steps to improve compliance. Geriatrics 1993;48(4):63-70. Shephard RJ. Exercise and aging: extending independence in older adults. Geriatrics 1993;48(5):61-64. Rooney EM. Exercise for older patients: why it's worth your effort. Geriatrics 1993;48(11):68-77. Silver AJ. The malnourished older patient: when and how to intervene. Geriatrics 1993;48(7):70-74.